Stravinsky's third ballet "Vesna Svyashchennaya" (or "The Rite of Spring") subtitled "Scenes of Pagan Russia" - was composed between September 1911 and March 1913. The premiere took place on 29 th May 1913 in Paris by the Ballets Russe with choreography by Vatslav Nijinsky. It was a great fiasco. As an example, this is the reaction of Giacomo Puccini: "I went to hear Le Sacré du Printemps: the choreography is ridiculous, the music sheer cacophony. it might be the creation of a madman. The public hissed, laughed, and - applauded." However, a year later (in April 1914 at the Casino de Paris) its concert performance as a symphonic suite became the greatest triumph of Stravinsky's career. This score shows Stravinsky as a great innovator in the way he treated folk material as well as harmony, orchestration and especially rhythm. The exploration of a particular rhythmic structure was often the starting point in the composing process of Stravinsky. According to his "Dialogues" with Robert Kraft, Stravinsky often began to form his "building material" by improvising rhythmical formulas based on a randomly chosen combination of pitches which "often became the final combination". The main rhythmic features of his music are: richness of syncopation, the use of complex and irregular time signatures (7/16,11/16 etc. ), the circumvention of square structures, and the use of polyrhythms and (hidden) poly-meters. The rhythm is treated by the continuous shifting of accents and by changing the duration of motives and musical phrases. This last method is well illustrated by the following example. This is a detailed analysis of the opening of the final movement of "The Rite of Spring" - "Velikaya svyashchennaya plyaska" (or the "Great Sacrificial Dance - The Chosen Victim"). This particular section gained a reputation as being one of the most rhythmically complex pieces ever written. However, if we look more closely we can see that this incredible complexity consists of just a few of the most simple elements. The passage finishes with a low "D" that becomes the first element of the main motive of the final movement. The second element is the syncopated dissonant chord in the strings, and the third element is the rest (with a pause) at the end of the bar. The elaboration of this motive forms the 33-bar principal theme that serves as a refrain for this movement written in rondo form. Composing this in a small hotel in Claran (Switzerland) Stravinsky could already play this music on the piano, but still did not know how to write it down. He eventually notated this using longer bars with irregular and complex time signatures. Later in 1921 after some performance experience, he decided to divide the bars into shorter and simpler meters, saying: "The bars of a shorter duration are more convenient for a conductor and orchestra, and considerably simplify the reading of the music". Continuing the process of simplification, he even doubled all note durations in some later revisions of this movement. Here in this version (of 1921) we can see short bars with irregular time signatures: 3/16, 2/16, 2/8, 5/16 and 3/8. 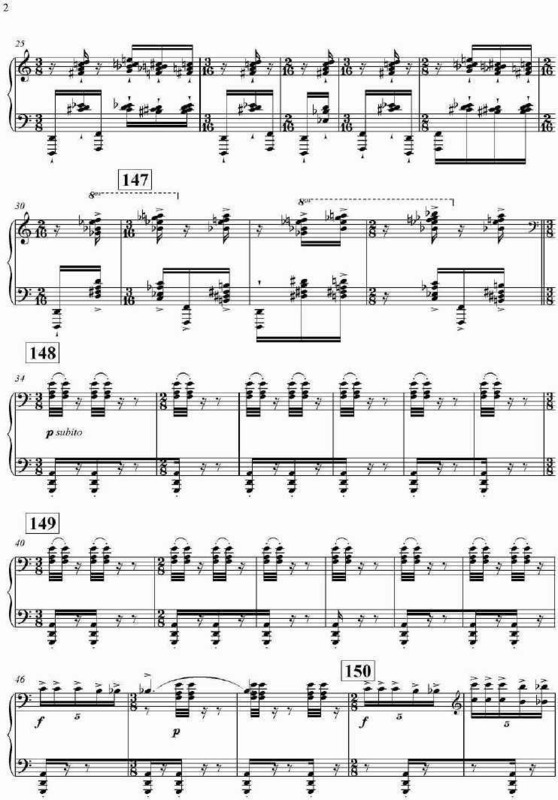 Also, Stravinsky limited himself here by using only three very simple note durations: 1/16, 1/8 (or 2/16) and 3/16. This however does not make the passage simple or primitive thanks to very clever and elaborated techniques of motivic variation. Let us look what is happening with all three elements of the main motive (Motive A). The first element, the note "D" in the Bass Clarinet on the first stressed beat, is changed in the second bar to the octave sforzando in Double Basses (arco staccato), and in the third bar - to Timpani (forte and secco). However, in the fourth bar this element is suddenly missed and changed into a rest (the third element of the main motive). We have to admit that the Bass Clarinet is used only once for this function - at the beginning of the movement. The repetition and development of this first element of the motive leads to the doubling of Double Basses with Tuba (from b.13) and then with Timpani (from b.22); it is shifted to the middle of the bar (from b. 13), and later to the end of the bar (from b.23); then the second note "F" is introduced (from b.23). The second element (the syncopated dissonant chord in the strings on the second beat of the bar (e = -b = -d-f#-a-c-d)) is doubled with horns and woodwinds in the second bar, and in the third bar it is slightly altered into c#-d-e = -f#-a-c-d; the duration is also changed - it is doubled (1/8 instead of 1/16). In the fourth bar it is fortified with three trombones that, together with horns and woodwinds, tie the chord to the first beat of the next bar, making it even longer. In the fifth bar this second element is repeated four times with different melodic shape and harmony, this forms a new motive - Motive B. Later (b.11-12), the same element is repeated 5 times with different melodic shape and harmony, forming one more motive - Motive C.
It is important to note that both of these new motives are not completely new formations, but the result of the transformation and development of the main initial motive, and this creates a strong unification and interconnection between all elements of this musical fragment. 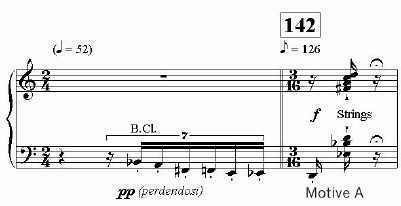 The third element (the rest in the last beat of the bar) is ignored in the second bar (2/16), where there is no place for it. 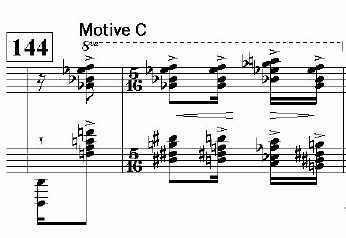 In the third bar (3/16 again), the presence of this element is conditional (we could imagine it because the quaver on the second beat is a short staccato), and in the fourth bar it is shifted to the first beat replacing the first element of the motive. This element - the complete rest - also appears at the beginning of bars 7, 8 and 21. 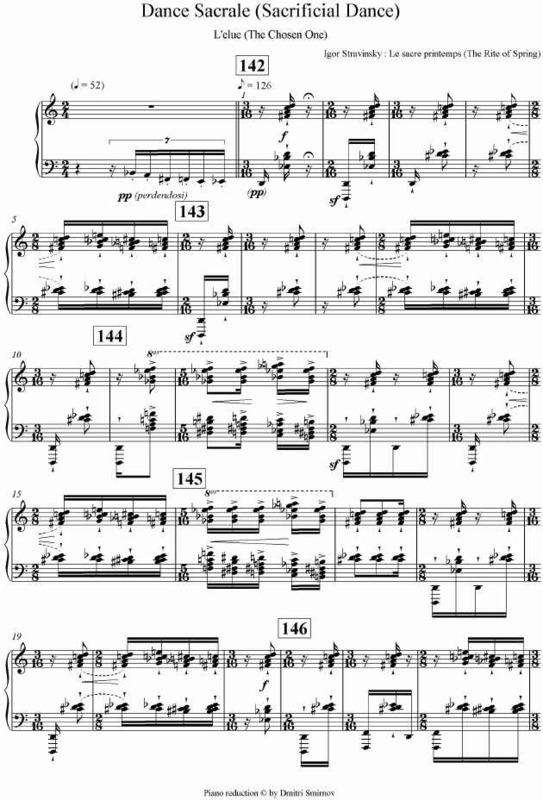 Its development culminates at the end where, after 11 bars of continuously playing with no rests, it is suddenly introduced on the first beat of the last bar of the theme (bar 33). In the first episode (beginning in bar 34), this element plays an even more important role. Using very limited means, Stravinsky managed to create a series of continuous variations, intriguing and exciting, all the time unexpected and surprising, full of wit and powerful energy, grasping the attention of listener throughout. "They occured because of the use of a different font for the symbol "flat" that does not exist in usual fonts. So instead of the symbol "flat" it is printed symbol "=" which actually has no sense. I would be appretiate very much if you could replace the symbol "=" with "b" (for "flat"). in paragraph 10: instead of: The second element (the syncopated dissonant chord in the strings on the second beat of the bar (e = -b = -d-f#-a-c-d)) is doubled with horns and woodwinds in the second bar, and in the third bar it is slightly altered into c#-d-e = -f#-a-c-d; the duration is also changed - it is doubled (1/8 instead of 1/16). In the fourth bar it is fortified with three trombones that, together with horns and woodwinds, tie the chord to the first beat of the next bar, making it even longer. In the fifth bar this second element is repeated four times with different melodic shape and harmony, this forms a new motive - Motive B.
has to be printed (highlited in red): The second element (the syncopated dissonant chord in the strings on the second beat of the bar (eb-bb-d-f#-a-c-d)) is doubled with horns and woodwinds in the second bar, and in the third bar it is slightly altered into c#-d-eb-f#-a-c-d; the duration is also changed - it is doubled (1/8 instead of 1/16). In the fourth bar it is fortified with three trombones that, together with horns and woodwinds, tie the chord to the first beat of the next bar, making it even longer. In the fifth bar this second element is repeated four times with different melodic shape and harmony, this forms a new motive - Motive B.